Don't overcrowd the griddle, or you can't flip burgers without them crumbling. Few would argue that the best burger comes hot off the grill, but indoor cooking on a griddle is sometimes the best alternative. Shape the patties slightly larger than the buns, and avoid smashing them with the spatula for optimal, juicy burgers. While a basic griddle is completely flat, you can find griddles that have ridges to give the burgers marks similar to grill marks and encourage fat to drain away from the meat. Form the burger into patties slightly larger in diameter than the buns, and to your desired thickness. The larger diameter accounts for shrinkage as the fat renders, so the finished burger is roughly the same size as the bun. Make an impression in the center of the burger so it doesn't bubble up, and instead cooks flat throughout. Add spices to the burger mixture before forming the patties, if desired, or simply sprinkle your choice of spices to the top after shaping them. Preheat the griddle over medium heat for at least 5 minutes. Spray the griddle lightly with non-stick cooking spray, or add just enough cooking oil to prevent the burgers from sticking. The griddle must be hot enough to develop a crust on the outside of the burgers, but not so hot that the outside of the burger burns before the inside cooks through. You can use a griddle pan or an electric griddle. Place the burgers on the griddle, leaving plenty of space between each burger. Leave the burgers untouched for about 5 minutes to develop a crust on the first side. 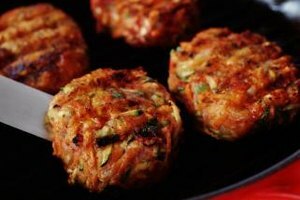 Do not press down on the burgers with a spatula because this squeezes out the juices and fat, leading to a dry, flavorless burger. Pour off excess grease if it builds up in the griddle as the fat renders out of the burgers. Griddles usually have shallow sides that can't contain the grease as well as a regular skillet. This might not be necessary for lean ground beef, but for ground beef with higher fat content, such as 73 percent lean beef. Flip the burgers, and cook for about 5 minutes more or until the internal temperature of each burger reaches 160 degrees Fahrenheit. Insert a meat thermometer in the center of each burger to check the temperature. While you can use timing as a guideline, cooking times vary greatly depending on the size and thickness of the burger, so a meat thermometer is the best way to ensure the burger is cook through. The amount of shrinking depends on the fat content in the meat. Leaner burgers don't shrink much when compared with high fat content meat because there's less fat to render out of the meat. This means you should form burgers with high fat content larger than lean burgers in order to achieve a finished burger of roughly the same size. 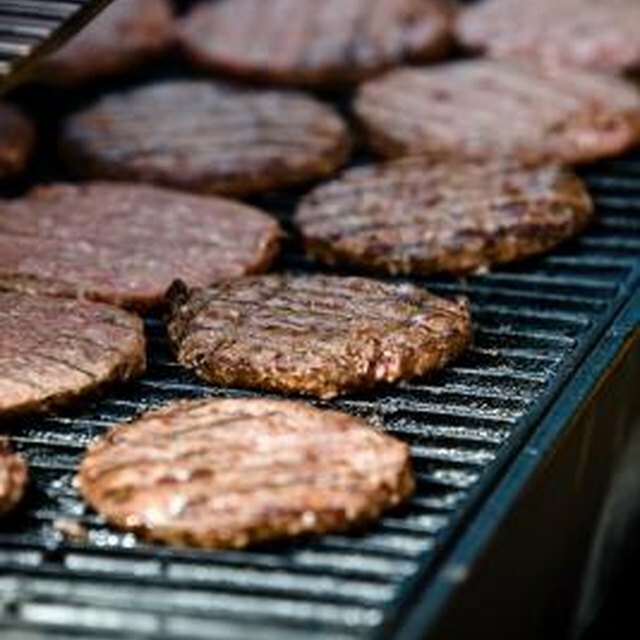 The USDA Food Safety Inspection Service recommends 160 F as the safe minimum cooking temperature for all ground meats, but you can eat burgers medium or medium rare at your own risk.